The Dogwood course at the Country Club of North Carolina is an Ellis Maples and Willard Byrd design that comprises half the golfing challenge at a fine 36-hole facility. Both courses date back to the 1960s and the Dogwood, like the Cardinal, occupies rolling sandhill terrain close to the Pinehurst Resort. Founded in 1963, the Country Club of North Carolina is a gated residential establishment that’s comprised of two separate communities, each of which enjoys the sporting amenities of tennis, swimming and golf within an enormous 2,000-acre property. It’s true to say the 36-hole golf complex and three recreational lakes are much in demand for the privileged homeowners who live here. The Dogwood is five years the senior of the two 18-hole layouts, making its debut in 1963, and it’s played host to a couple of USGA events since it first opened for play. The 1980 US Amateur Championship was won at this venue by a then 22-year old Hal Sutton then, more recently, Doris Chen claimed the US Girls’ Junior Championship in 2010. Apart from the 153-yard 3rd, which plays to an island green, the more memorable holes on the Dogwood are encountered on the back nine, with many of the fairways routed around the shimmering waters of Watson Lake. Best of these is probably the 204-yard 16th, which plays across the northern corner of the lake. After almost forty years of use, Arthur Hills and Steve Forrest renovated both courses over a period of four years, starting in 1999. Fifteen years later in 2016, Kris Spence performed another renovation, which tackled resurfacing and expanding the greens, remodeling bunkers, improving drainage and removing trees. Sometimes being in the right neighborhood can pay off handsomely and that is the case for CC of NC / Dogwood. The layout for many years benefited from being in the Pinehurst vicinity and the overall depth of courses in The Tar Heel State was nowhere as deep as it is now. That's not to say the course is not worthy of a visit. When stretched to over 7,200 yards it can be a handful for many. But the design is just adequate in having the kind of design inclusions one sees today at the top tier layouts in the State. As has been mentioned -- the course is really a mixed verdict. The outward nine is good but not especially noteworthy. Fortunately, the return side picks up the slack considerably with water in play on six of the holes and the movement required off the tee shot is at a high level. The closing 18th is the kind of par-5 that yields birdies only grudgingly. The Dogwood would benefit from an update -- nothing drastic by any means but something to shake a bit of the dust off especially on the front side. If such work could be done then the layout may indeed be worthy of mention with the elite few in this grand golf locale. Doug, appreciate the comment. My last round at the course came just before the renovation you mentioned. If you look at the comment from David Davis he scores the course at the same level as I did and his round came after the work was done. I'm curious to know if you see the latest version being worthy of the upper echelon status -- as in top ten -- the course has long had in the Tar Heel State? The depth of courses in NC, as I mentioned in my review, is far beyond what was present from 25-30 years ago when Dogwood reigned among the elite. I still like the course but so much quality golf has really blossomed throughout the State and I just wonder if having a Pinehurst address added a few more brownie points to its pedigree. I had the opportunity to play the Country Club of North Carolina’s Dogwood course last summer. It’s a fun and challenging modern design that flows through the sandhills of North Carolina in the Pinehurst area. 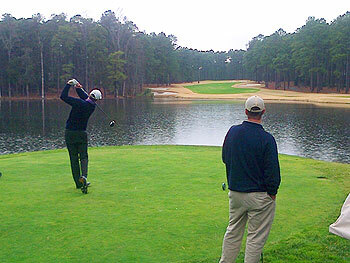 Dogwood is the championship course at CCNC and can be stretched out fairly long to challenge the world’s best. It’s a tree-lined parkland course with several water hazards that have been designed to naturally fit in the landscape. It has large greens with varying pin positions to increase the challenge and variety available. To play the course well the golfer will be required to shape the ball in both direction off the tee or play shorter clubs requiring longer irons or hybrids for the approaches. CCNC also has wonderful practice facilities and as a side note some of the only range facilities I’ve ever seen where Pro V 1’s are being used. For me it’s worth a visit only to spend a day at the range seeing how great a practice session truly can be. CCNC is a private club so an invite is required to enjoy the course but the two courses make for a great day out. Once listed in the Top 100 Golf Courses in the World by Golf Magazine in 1985, it has long since been surpassed by golf courses of significantly higher credentials. In fact, the other course at CCNC, ‘Cardinal’ is superior and much more favoured by the membership. This club was once one of the most prominent clubs in the country, especially with its proximity to Pinehurst and having 36 holes. The Dogwood earns its merits mostly from the commendable design variety on the back 9 holes. The ‘winter-kill’ throughout the course has significantly hampered the historically wonderful playing conditions. I had the privilege of playing the CCNC during my son’s practice round for the first CCNC Amateur event; a 54 hole tournament on the Dogwood course involving some of the best College players and other leading amateurs. The first impression of the CCNC is upon arrival at the security gates, which are fully manned and will not be allowing you to pass unless you are expected. 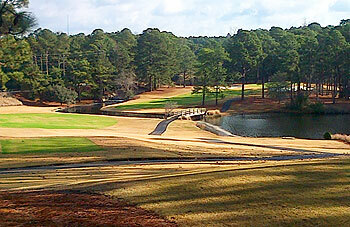 Unlike many of the courses in the Pinehurst area, which are open to the public, CCNC is private and exclusive. The moment you are past the gates, and into the undulating, tree lined estate, you know you are in for a special treat. Once you have reached the car park you are conscious that you are at a golf club that just oozes quality. Clubhouse, driving range, halfway house (rather than hut), buggy fleet, chipping areas and putting greens all of the highest quality, but that’s only the beginning. There are two courses at the CCNC and by all accounts the Cardinal is an excellent test of golf, but it is the Dogwood course that receives the most acclaim. It is 7200 from the tips, and as there had been quite a bit of rain it was wet and playing it’s full length. Despite the damp conditions though the greens were firm, fast and true. The course is lined with Pine trees, very common in the area, and visually is a stunning looking course. During the winter months in this part of the world, the Bermuda grass becomes dormant and turns brown, so the fairways are overseeded with Rye grass to make them green. So every hole had a clearly defined green fairway, with yellowy brown flanks, which ended at the edge of the trees or the water. Beneath the Pines is a bed a pine needles, which a shade darker than the rough. This gives each hole a distinct definition, and it was wise to avoid the pine needles, as the ball tended to skid deep into the pines. There are many memorable holes, but the island green par 3 3rd, the 560 yard 9th on the front 9 stand out. However, it is on the Back 9 where the course is especially beautiful, with water coming into play on 6 of the holes. The final six holes are a very stern test of golf; set around huge lakes and requiring a cool head to close out the round and stay out of the water. The Par 5 18th is a magnificent and truly spectacular finish requiring a drive that misses the water on the left and big bunkers on the right, before turning left at the dogleg and up a steep hill to the green sitting amongst the pines with views overlooking the lake below. A very special golf course and a true 5 star experience.